Late 1630s the Dutch economy went crazy, the market traded at astronomical prices tulips amounting without ever reaching the limit. People began to behave irrationally. Luxury homes were sold in exchange for a single bulb, and flowers were sold in exchange for the salary of fifteen. A single bulb could be worth 1,000 florins (the average person in the Netherlands had an annual income of 150 florins). In 1635 they came to pay 100,000 guilders for 40 tulip bulbs. He even came to pay 5500 florins for a single bulb of Semper Augustus precious species. This situation began to create a bubble in which prices rose and rose and never fell. The Dutch population is generated the illusion that the tulip market would always be a bull market. Such was the euphoria that was created a futures market where trading bulbs not collected yet, this business was called "windhandel" which translated means "air business!" All social status began investing in tulips flowers and disposing of their most basic, and even went into debt to acquire mortgaged tulips. There came a time when it is no longer exchanged bulbs but formed a real financial speculation through credit notes. Well into 1637, speculators began to detect signs of exhaustion in the tulips flower market. On February 5, a batch of 99 great rarity tulips was sold for 90,000 florins. Investors decided to start selling and collecting profits. This attitude was quickly infected the rest of the market, generating a significant amount of supply of tulips that led to widespread panic in the country. In mid-February, the holders of bulbs bought at astronomical prices they met overnight with no buyer, was even worse for the most daring speculators who had signed futures contracts obliging them to buy the bulb at a much more higher than the market. The bubble burst left much of ruined investors, as they had liquidated its assets to speculate tulips that ended without any value. He saved all the bubbles as more rational investors left the market just before it exploded, triggering panic in this way in the country. 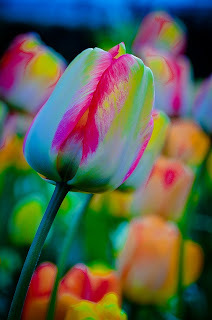 Since then Holland for years engulfed in a major economic recession caused by the tulip bubble.